Jeb Bush and Hillary Rodham Clinton are among the speakers at the Globalization of Higher Education conference today in Irving. Their presidential plans may be uncertain but one thing is clear: Jeb Bush and Hillary Rodham Clinton keep bumping into each other – this time, in North Texas. Bush and Clinton were taking the podium today at a higher education conference in Irving organized by Bush, the former Florida governor who is the brother and son of Republican presidents. The former secretary of state, whose husband, Bill Clinton, served two terms in the White House, is the leading Democratic contender in 2016 if she runs for president again. 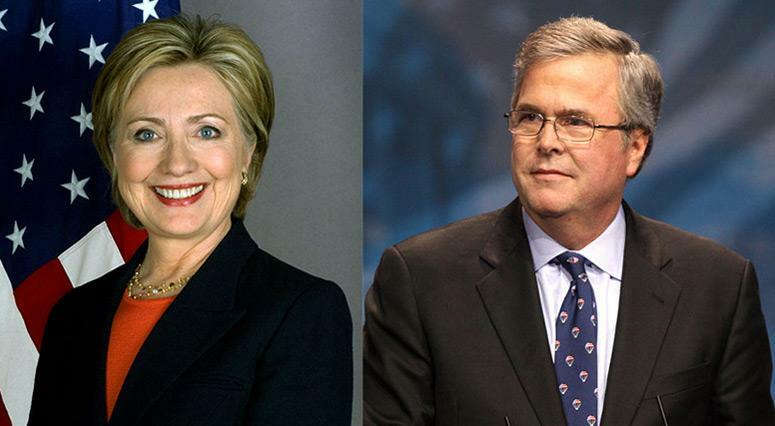 As both Clinton and Bush weigh their options, the conference offers a bipartisan twist for the two dominant American political families of the late 20th century, both of whom could return to the presidential stage next year. It is at least the third time in the past year that Bush and Clinton were crossing paths. Last year, both were on hand in Dallas for presidential library dedication of former President George W. Bush, Jeb Bush's older brother. Mrs. Clinton sat on stage with her husband and four other living U.S. presidents attending the ceremony, including the Bush patriarch, former President George H.W. Bush. In Philadelphia last September, Jeb Bush— in his role as chairman of the National Constitution Center — awarded Hillary Clinton the Liberty Medal, an event which allowed both to offer plenty of presidential-themed banter. Bush said while he and the former first lady "come from different political parties, and we disagree about a lot of things," they agreed on the wisdom of the American people, "especially those in Iowa and New Hampshire and South Carolina," traditionally the first contests in the presidential primaries. During a speech Saturday at the Clinton Global Initiative University in Arizona, Hillary Clinton noted that 6 million young people age 16 to 24 are neither employed nor in school. She cited the need for a higher education system that would promote those pursuing college degrees and vocational training alike. "There are a lot of important jobs to be done that may not require a college degree but require a respect for the dignity of the work that is being done," she said. Bush has been a leading advocate for education reform since serving as governor. He overhauled his state's educational system, tying teacher raises to student performance and boosting educational standards. Bush has been a vocal supporter of Common Core standards, which specify what math and reading skills students should achieve in each grade. Some conservatives have criticized the standards as a federal intrusion into local classrooms. 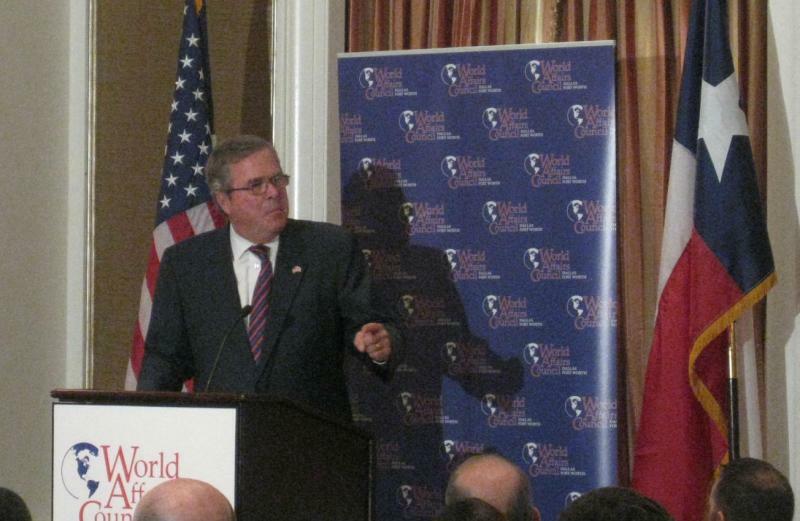 Two of the biggest names in the 2016 presidential derby are in Dallas today: Jeb Bush, the former Florida governor and brother of the ex-president, talked with the Dallas World Affairs Council. And Hillary Clinton, the former Secretary of State and first lady, will speak to a closed meeting of housing executives tonight. 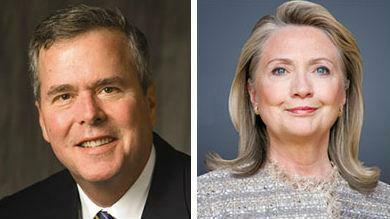 Two potential presidential candidates are in Dallas today. Former Florida Governor Jeb Bush will talk about immigration to one organization. Then in the evening, past Secretary of State Hillary Clinton will address a group of apartment executives.